Holiday Monterey 2014 – Monterey County Pops! Monterey County Pops! 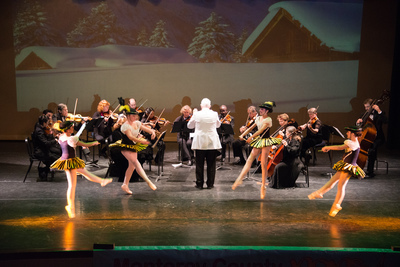 is pleased to announce the first performances of its String Orchestra in two free “Holiday Concerts for Kids, Families, and Friends.” The concerts will take place on Saturday, December 20 at 7:00 p.m. in the Stanton Theater in King City and on Sunday, December 21 at 3:00 p.m. in the Monterey Conference Center, Steinbeck Forum. Local violin prodigy, five-year-old Nicholas Brady, will appear in the Monterey concert performing a violin concerto by J.S. Bach. This will be his final local performance before his family moves out of the area. For the King City concert the Pops! will be joined by the Sol Treasures Youth Orchestra and the Timshel Community Chorus. In addition to the Nutcracker, both concerts will include the baroque classics “Canon” by Pachelbel and selections from Corelli’s “Christmas Concerto.” America favorite pops composer, Leroy Anderson” will contribute “Sleigh Ride,” “A Christmas Festival,” and “Jazz Pizzicato.” The concert will conclude with a sing-along of holiday favorites.